You gain 19,999 points [?] Loyalty program points By purchasing products included in the loyalty program, you gain points, which then can be exchanged to other products available in the store or for a permanent discount. Only available to registered customers. When it was revealed back in 2008, the Lenovo ThinkPad X200 series was striving to offer the same high-quality ThinkPad feel and experience for the first time in an extremely small but portable 12-inch size. The original X200, however, lacked numerous built-in connectivity options and may have potentially turned off the same business users that it was attempting to attract. Fast forward to today and the ThinkPad X200 series has now become the de facto notebook for business users alike looking for a 12-inch secondary or even primary notebook. The launch of the ThinkPad X220 last April was highly lauded by reviewers as worthy of the ThinkPad name despite the minute size. In our last review, we particularly praised the X220 for its sturdy case, low noise, long battery life and for having one the most impressive displays for its size class. The ThinkPad X230 updates the lineup not with brand new looks, but with the new Precision Keyboard layout and the all-important Ivy Bridge chipset under the hood. Otherwise, exterior qualities remain largely the same as last year’s model. Although seemingly trivial at first glance, these two changes directly affect the user experience and can actually make the X230 feel like a different beast compared to the X220 despite their similarities. In this review, we investigate the changes both inside and out and give our final thoughts on the rather controversial keyboard update. Lenovo decided to take the “if it ain’t broke, don’t fix it” approach to the design of the X230. Indeed, the 2012 model is every bit as similar to the 2011 model at first glance, but the manufacturer has managed to shave off a third of an inch from the 34.6mm (1.36 inches) rear end of the previous model to just 26.6mm (1.05 inches) in the latest offering. The thickness of the front edge remains at 19mm, meaning that users will be getting the same resistant chassis but in a sleeker and somewhat lighter (1.34kg vs. 1.54kg) package. It’s still stocky to be sure, and users will still need both hands to open the lid, but the classic ThinkPad professionalism and appearance are unmistakably preserved. It’s true that Ultrabooks have since risen into the scene and now competes with the X230 to some extent. The ThinkPad X220 faced no such problems during its launch, but we can say with confidence that although the Intel ultrathins are much thinner, lighter and more stylish than the conservatively built ThinkPad, the construction of the latter is in a class of its own and even maintains around the same level of portability. The magnesium alloy chassis is thick, the dual hinges are firm with little to no vibration and both the case and lid experience little to no side-to-side twisting or creaks. But since the all-matte design has remained essentially unchanged, a few issues we found on the previous model have yet to be amended. Aside from the notebook being a complete fingerprint magnet, the left palm rest is still noticeably more susceptible to finger depressions due to the hollow ExpressCard slot immediately underneath and the textured outer lid sinks slightly when pressure is applied. Fortunately, the cheap-feeling ThinkVantage bar of the X220 is now a part of the keyboard for better stability and no wobbling issues. As for the warping display border, we experienced no such issues when using the notebook outdoors under 80 degrees F (27 C) weather. For a full walkthrough of the quality of the case, see our review on the previous X220. But in short, you’d be hard pressed to find a consumer-oriented 12-inch notebook with similar construction quality and connectivity options. It’s worth noting that the new Samsung Series 4 directly challenges the ThinkPad in terms of exterior build and longevity, but users who go for the latter option will give up certain important performance advantages that the X230 offers. For connectivity, the X230 is littered with the same options as its older siblingas expected. In other words, the notebook offers more connections than what its small size would otherwise suggest. Three USB ports are included just like the X220, but two of these ports are now standard USB 3.0 ports regardless of configuration. Apart from that, all physical ports can all be found exactly where they were on the 2011 model. They are easy to reach as none are on the back and most are close to the front of the side edges. Unfortunately, this also means that cables can more easily entangle the user if multiple devices are connected simultaneously. The Gigabit Ethernet port is also still oddly positioned up front instead of its more typical location further back. A downside of having so many available ports on such a small notebook is the issue of space. For example, connecting a USB device with a thick plug can potentially block access to adjacent ports. For example, utilizing the ExpressCard slot can easily make both the USB 3.0 port and WiFi switch underneath very difficult to reach. Still, we’re appreciative that these ports are available to begin with and we definitely welcome their company despite the tight legroom. eSATA and HDMI ports are most notably missing, but users can always invest on an aftermarket DisplayPort-to-HDMI adapter. Although not configured into our test unit, certain models can also be equipped with a SmartCard reader. We tested the aging VGA-out port to confirm if the same display quality issues we found on the X220 had carried over. Fortunately, text and colors appear crisp on two separate external monitors at the tested native resolutions of 1280x1024 and 1920x1200 pixels, respectively. Our X230 review unit only came equipped with the standard single-band (2.4GHz) 2x2 dual-stream Centrino Wireless-N 2200 adapter for WiFi, WiDi and Bluetooth 4.0 connectivity. However, users can preconfigure the system with a WWAN PCI-e Minicard to support Gobi 3k 14.4 Mbps/HSPA or even Gobi 4k LTE under Verizon’s wireless network. Those who wish to take advantage of AT&T’s network can opt for the Ericsson HSPA+ WWAN PCI-e Minicard instead, which will work on both WCDMA/HSPA+ and GSM/EDGE networks here in the States. WiMAX users aren’t left out either as the Intel WiFi card can be upgraded to support WiMAX 6250 and its multi-band streams. In short, Lenovo has gotten all WWAN bases covered even before the end-user has a chance to add in an aftermarket PCI-e Minicard. Fortunately, users can still swap out cards quite easily if need be by opening up keyboard and palm rest plate with a Philips screwdriver. The HDD and RAM are even more accessible and only require removing a couple of screws underneath. Lenovo has a history of supporting their core ThinkPad lineups with vast options and accessories in an attempt to satisfy the broadest range of business users out there. As a result, expect plenty of quality first-party extensions both by USB and docking port. Perhaps the most notable USB-powered accessory is the ThinkVision LT1421 – essentially a portable 14-inch external monitor powered solely by USB 2.0. The X230 is backwards compatible with all docking stations supported by the X220 as both models share identical docking ports. Lenovo docking stations have one of the biggest selections of ports, including VGA, 2x DVI, 2x DisplayPort and 6x USB 2.0 from the Mini Dock Plus port alone. The Ultrabase Series 3 adds an Ultrabay for hot-swapping optical drives and secondary HDDs. Users simply looking for longer battery life can practically double runtime with a slim secondary battery similar to the secondary battery “slice” modules that certain Sony VAIO models offer. The wide selection and compatibility options make the X230 feel more easy-to-use and capable than many similarly-sized competing business notebooks. Lenovo’s Service is standard with a warranty of up to one year, but can be extended up to five years total for $160. The usual onsite or next business day repair and accidental damage protection services are optional coverage as well and will add $90 - $100 to the warranty, at least in the United States. A “no questions asked” battery replacement plan for up to four years is available as a separate warranty plan for $139. After years of having the same keyboard design across their ThinkPad lineup, Lenovo will this year be introducing its new (and mandatory) Precision Keyboardto many of its latest model revisions including those of the popular L, T, X and W series. The keyboards of the ThinkPad X1 or Edge E420s released in mid-2011 can be considered precursors to the new design and may be something that veteran ThinkPad users may not be very fond of at first glance. The classic beveled keyboard layout typically associated with ThinkPads has been completely dropped in favor of a Chiclet-style build (29.0cm x 11.5cm) that now more closely resembles other keyboards found in other notebooks. The flat, evenly-spaced keys are quite an odd sight to see on an otherwise traditional ThinkPad. According to Lenovo, one of the reasons for the change is that the more modern island design allows for a larger target area per key, which should theoretically lead to fewer errors while typing. In our opinion, the new setup does indeed feel more streamlined and clean andeven less cramped, although fingerprints will build up quickly. Clatter has also been reduced, but we found the keys to be a bit softer (especially the top row F keys) than what veteran ThinkPad users may be used to. Nonetheless, key depthis still adequate and feels deeper than most other Chiclet keyboards even on larger notebooks. Perhaps the greatest benefit of the chiclet style is that it allows a keyboard backlight. Although only two levels of brightness are user-controllable on the X230, the backlight is nonetheless very bright and will surely be welcomed by ThinkPad fanatics. The trademark ThinkLight feature remains as well, although the notebook does not allow both the backlight and ThinkLight to be active simultaneously. Traditionalists will be pleased to hear that the tried and true ThinkPad touchpad remains more or less the same on the X230. The textured touch-sensitive surface curves downward on both the bottom and top and is overall quite small (7.5cm x 4.5cm) since some room was reserved for the dedicated left- and right-click keys immediately above. Oddly enough, both of these keys are now flatter with no curved recesses as opposed to the X220, a design decision that mimics the touchpad of the X121e in appearance. Users can even ignore the dedicated click keys altogether as the touchpad surface itself is clickable. In terms of functionality, the touchpad works generally well. Single-touch use is responsive and works as intended, but multi-touch gestures like pinch-to-zoom or even two-finger scrolling do not register dependably. The dedicated click keys are near silent when pressed, but the tactile feedback is rather soft and spongy instead of firm as a result. Clicking on the touchpad surface provides shallow but satisfying tactile feedback and is actually very quiet as well. As with most clickable touchpads however, the upper half on the surface area is much harder to click on than on the bottom half. Of course, the reliable TrackPoint returns unaltered and functions just as consistently as it has been for years. There is still room for improvement in terms of multi-touch capabilities and tactile feedback, but the surprisingly quiet touchpad works just fine and swiftly for basic needs. The 12.5-inch matte IPS display supports a native resolution of 1366x768 pixels, which we found to be just fine considering the sub 13-inch screen size. The X230 is available with a standard TN panel as well, but it’d be difficult to move back to regular TN displays after experiencing the advantages of an IPS panel. Lenovo claims up to 300 nits and 200 nits of brightness with the IPS and TN panels, respectively. 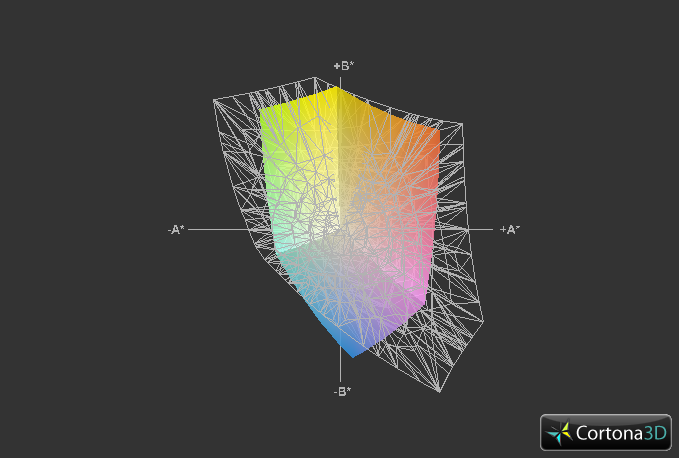 Subjectively, text and images appear clear and crisp without oversaturating colors as some glossy displays might do. Before we move on, it’s worth noting that the display panel (ID: LEN40E2, Model: LP125WH2-SLB1) in our review unit is exactly the same as the display panel of our reviewed X220. Therefore, the measured monitor data below should be quite similar to our results from the X220 review. We tested maximum brightness with a Gossen Mavo-Monitor and recorded a peak of 280 nits or a tad below the claimed 300 cd/m2 maximum. Lenovo makes up for this by having excellent black levels and thus a very respectable contrast ratio for better movie and gaming experiences. Maximum brightness does not take a dip when the notebook is unplugged either, which could not be more important for a notebook designed to be used on-the-move. Most users may find themselves settling for a brightness level of 11/15 or greater when using the notebook under typical indoor ambient lighting conditions. 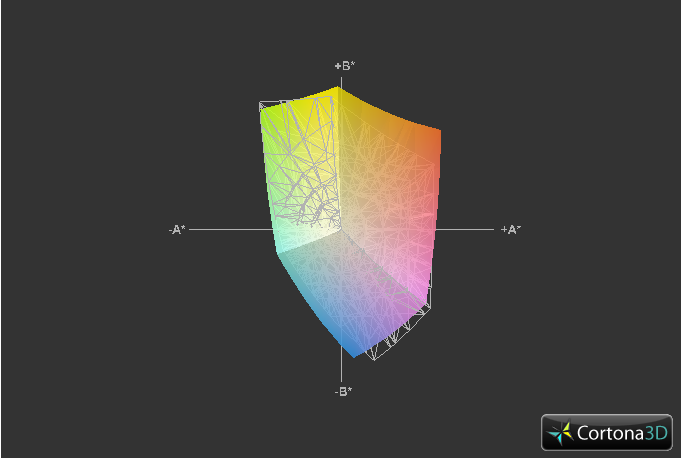 With the XRite i1, the display of the X230 showed a gamut volume of about 66 percent of the sRGB standard. While not incredible, the color reproduction of the display is in line with its close competitors and is slightly better than most budget TN panels. Generally speaking, typical business users should find the gamut range perfectly acceptable as only professional graphic artists will find the X230 not suitable for meticulously accurate colors for heavy digital graphics work. Even though the panel doesn’t reach the claimed 300 nits, an average brightness of above 200 nits is in our eyes the bare minimum for outdoor notebook use. Fortunately, the X230 is certainly usable outdoors, but users may have to turn the brightness up to its maximum for comfortable viewing. Glare is hardly a problem as well due to the matte display and the IPS screen means multiple users can easily view onscreen material simultaneously, even when outdoors. However, brightness could have been better as other ultraportables like the Asus UX31 or Samsung 900X3B can be much brighter for potentially better outdoor usability than the X230. The IPS display provides very wide viewing anglessimilar to the X220 and continues the tradition of having one of the best displays in the subnotebook category in terms of viewing stability. Viewing even from extreme angles is possible, although slight drops in apparent brightness can occur. Regardless, one of the draws of an IPS display is its ability to allow multiple viewers from wider angles without experiencing apparent shifts in display color. Although users can equip the X230 with a TN panel, the IPS option is a worthwhile investment. 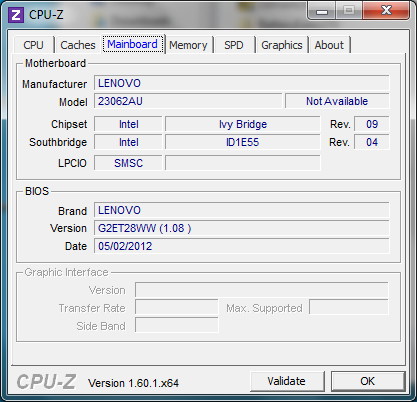 As part of Lenovo’s 2012 lineup, the X230 uses Intel’s third generation Core ix CPU as expected. Our specific model on hand uses the new 2.6GHz Core i5-3320M, but users can upgrade to a 2.8GHz Core i5-3360M or a 2.9GHz i7-3520Mor even downgrade to a 2.4GHz Sandy Bridge i3-2370M if need be. Either way, all options are standard-voltage dual-core CPUs, meaning there will be no corners cut in terms of performance in favor of potentially lowering system temperatures. The i5-3320M supports Turbo Boost and Hyper Threading like its 32nm bigger brother at a 35 watt TDP. Turbo Boost allows a maximum of up to 3300MHz and 3100MHz for single-core and multi-core operations, respectively. 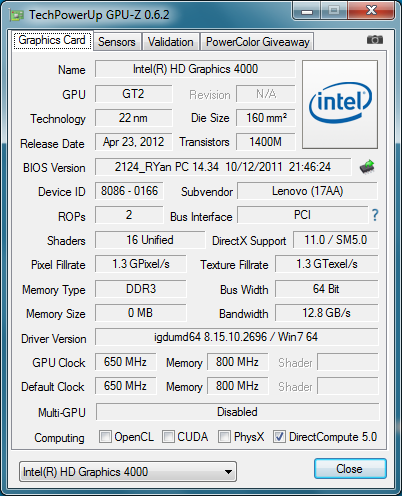 Being an Ivy Bridge CPU, the dual-core i5-3320M has the built-in integrated Intel HD 4000 GPU. This successor to the Sandy Bridge Intel HD 3000 has been extensively tested here on Notebookcheck, although we will continue to update our gaming benchmarks with more data as the GPU is relatively new to the scene. In the X230, the integrated Intel will normally idle at 350MHz, but Turbo Boost will bump the GPU all the way to 1200MHz if the application demands while the memory bus is a constant 800MHz in comparison. For more information on the HD 4000, see its dedicated benchmark page here. 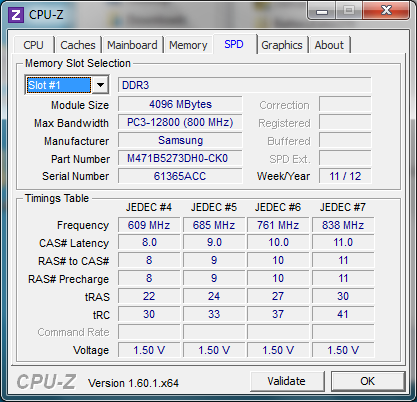 4GB DDR3 RAM is provided by Samsung in one module out of the two slots available. 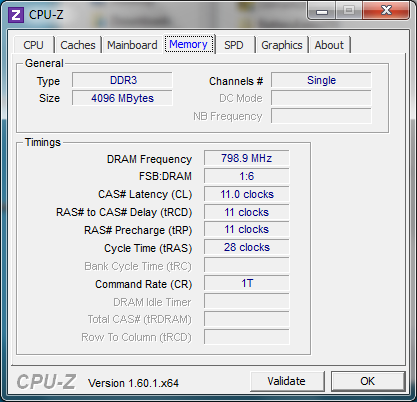 Unlike most Ultrabooks, the RAM is not soldered and is easily upgradeable on the consumer end. 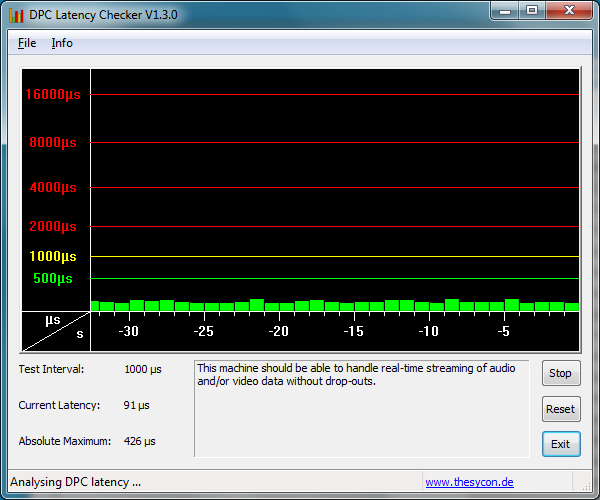 DPC Latency Checker also recorded no periods of high latency even with WiFi active. 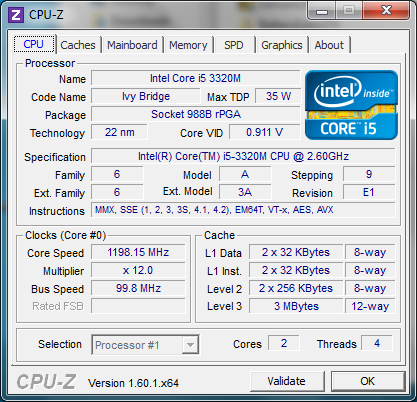 In the synthetic CPU-oriented benchmarks, the i5-3320M is toe-to-toe with many mid-range Sandy Bridge CPUs and even some high-end ones depending on the benchmark. For example, the 3DMark 06 CPU score (3807) in the X230 is extremely close to the dual-core 2.7GHz i7-2620M in both the Lenovo G770 and Fujitsu Lifebook S761 notebooks and we found similar results in both the 32-bit and 64-bit single/multi CineBench rendering tests. The single-threaded Super Pitest showed results comparable to the i7-2640M in the ThinkPad X1 while the multi-threaded wPrime test had results closer to the i5-2430M in the MSI GE620DX-443XPL. We also tested encoding speeds with the X264 HD 4.0Benchmark and went away with final scores similar to an i7-2640M yet again. Even without further benchmarks, the new i5-3320M has proven itself as more than sufficient for everyday browsing applications and even capable of more CPU-intensive tasks. Overall performance from the synthetic GPU benchmarks isn’t as impressive as the CPU, but scores are nonetheless good for an integrated graphics chip. The 3DMark 11 scores in particular put the Intel HD 4000 in the same ballpark as the entry-level GeForce 610M and Radeon HD 6470M while the 3DMark Vantage GPU score places the Intel chip between a Radeon HD 6680G2 and a GeForce GT 525M. Performance in older 3DMark benchmarks, however, appear to indicate performance levels closer to an HD 3000 in applications based on DirectX 9 or below. We use PCMark 7 and PCMark Vantage to assess general system performance. Final scores are impressively high for a 12.5-inch subnotebook at 2880 and 8503 points in PCMark 7 and Vantage, respectively. In fact, these scores put the X230 extremely close to the high-end Asus G74SX (8553 in Vantage) and MSI GT70(2875 in PCMark 7), both of which sport quad-core Sandy Bridge CPUs and discrete GeForce GPUs. However, these two benchmarks are notorious for skewing final results in favor of SSD-based systems, so certain lower-spec notebooks like the Samsung 900X3B (3609 and 10111 in PCMark 7 and Vantage, respectively) can still outscore even more powerful systems that are bogged down by traditional HDDs. SSD options for the X230 are available, but our review unit is equipped only with a single HDD. Speaking of traditional HDDs, our X230 under review came equipped with a 320GB 7200RPM Hitachi TravelStar and nothing more. Lenovo does offer multiple SSD options before purchasing, including a 32GB mSATA drive and even SATA III SSDs from 128GB up to 256GB. Although expensive, an SSD upgrade is perhaps the most palpable upgrade one can have for the X230, second only to the IPS display. We also found no problems when installing our own mSATA SSD into the X230. In this case, we installed a 60GB Renice X5 SSD with no issues as Windows was able to recognize the secondary drive. In theory, users should be able to install and boot Windows 7 on the mSATA drive for even faster speeds than with a standard HDD. Note, however, that there is only one PCI-e slot for either an mSATA drive or a WWAN card - both cannot be installed simultaneously in the X230. Average transfer speeds with the Hitachi drive approach 87MB/sec according to HDTune, much better than typical 5400RPM drives that often score 80MB/sec or below. Although good, the Hitachi isn’t the fastest 7200RPM drive out there as some high-end notebooks have HDDs reaching 90MB/sec or above. 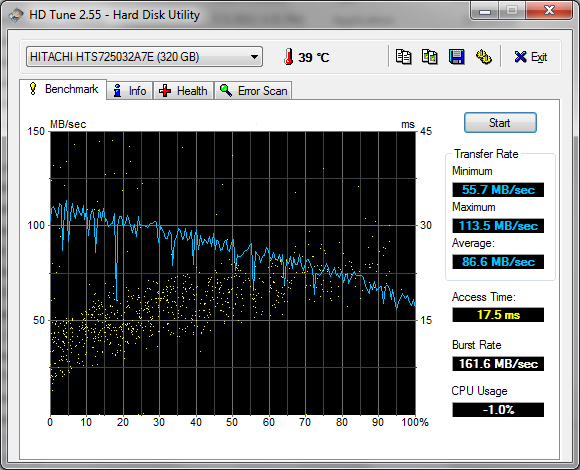 The 750GB Hitachi in the HP Envy 15, for example, had an average transfer rate of 92.7MB/sec with a small edge in access time as well. For our extensive and growing table of HDD/SSD performance benchmarks, see here. Of the theoretical 320GB maximum, 13.6GB is reserved for system recovery and 282GB is left available in the default (C:) drive. The Intel HD 4000 provides a noticeable increase in gaming frame rates over the previous HD 3000 of the Sandy Bridge generation. While no one is expecting amazing performance in 3D graphics, the integrated Ivy Bridge GPU allows the X230 to play most recent 3D games on the move, albeit in low detail settings. In fact, Skyrim is now playable at just under 30 FPS, whereas the older HD 3000 had much more trouble running the popular Bethesda RPG even on low settings. 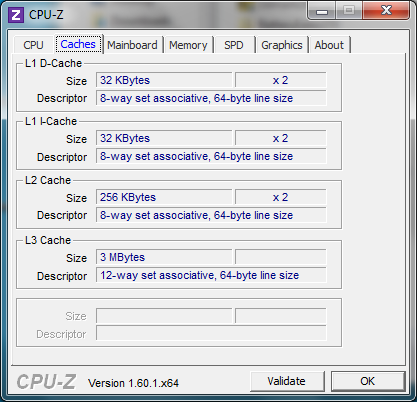 The low native resolution of the system also mean that certain games can be playable up to medium settings if need be. But this is still an integrated graphics solution, so demanding games like Alan Wake and by extension Battlefield 3 are not recommended even at their lowest settings. At its default settings, the X230 is subjectively very quiet(~31.5dB) and almost inaudible when in the office and around typical ambient noises. Fan speed does not appear to unexpectedly increase or decrease while browsing the web, watching videos or word processing, and is always a steady but virtually unnoticeable humduring typical daily workloads. The spinning hard drive is also hardly noticeable at all.